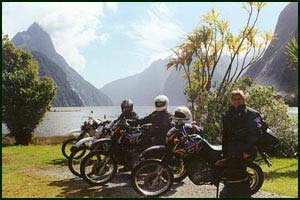 On an immaculate day in paradise we pick up the hired motorcycles in Christchurch, the Garden City. Six women from all over the world cruise out of town along the windy Peninsula road. The sea sparkles in vibrant colours on the left and the rim of an extinct vulcanoe creates the skyline on our right. I smile in anticipation. I like the first day on tour: to see on the faces of the others how this little country at the end of the world with its fairy-tale like scenery just blows them away. We always take it easy on this first day. In Akaroa, the little township on the peninsula, we watch the water bubbling with dozens of dolphins jumping out of the water and diving under again. They are just one arm length away from us and we can see them eye to eye in the clear water. The next day we reach the Southern Alps, New Zealand�s 'backbone'. The vivid turquoise of the glacier lakes, due to the natural levels of phosphate in the water, look surreal amidst the surrounding tussock land and snow covered mountains. This evening we experience a spectacular sunset in the colours purple, pink and orange before we fall into a dreamless sleep. An early start the next morning reassures us that we will reach the old University town of Dunedin for our date with penguins, sealions, seals, albatrosses and other rare New Zealand wildlife on the Otago peninsula. Lurking in the dusk we hold our breath waiting for the first penguin to appear. A wave travels ashore and like Phoenix a little penguin materialises, stands up and walks towards us over the sand. Petra pinches my arm to make sure she is not dreaming. After a coffee-stop in one of the many nice Cafes of Dunedin we are off to world renown Milford Sound. Milford Sound is a world heritage area like the Grand Canyon and other places of internationally acknowledged significance. It stands apart as a region of distinct character formed by glaciers over the last 2 million years. The road to Milford through dense native bush and rugged mountains with many spectacular twists and views, is one of the best rides Downunder. Next day we take a steamboat over to 'thrill zone' Queenstown. The TSS Earnslaw,, 90-year old Lady of the Lake is a breathtaking picture, is one of the last steamboats of her age in service. When we reach Queenstown on the other side of the lake we are overwhelmed by the stunning view of 'The Remarkables' the steep, rugged backdrop looming above the mirror-like surface of the lake. Life in Queenstown is all 'go' with choices of a thrilling offroad tour with two and four wheelers, the "world�s most thrilling jet boat ride" , or the challenge of a spectacular bungy jump. From Queenstown we go on to the magnificent West Coast. This area holds world records in rain fall and is often affectionately referred to as the 'Wet Coast'! We are more than lucky to catch one of the rare sunny days here. We now experience the Southern Alps from the other side. Two glaciers, Franz Josef and Fox glacier, ooze down towards sea level and can be seen not far from the main road. They are the fastest moving glaciers in the world. We learn about the culturally treasured pounamu or jade that is only found in certain rivers of the West Coast and then we reach the Pancake Rocks of Punakaiki, one of the seven wonders Downunder. With every high tide the water level dramatically rises several metres. The next day we ride through the Buller Gorge, New Zealand�s �little Grand Canyon�, on our way to the exotic Abel Tasman National Park. The beauty of this park is best seen by quietly paddling our hired sea kayaks off golden beaches, through warm clear blue-green water in absolute tranquility. Our two days at the lodge are just too short but everybody is happy to be back on the pegs as we head through the picturesque Marlborough Sounds towards the ferry harbour to the North Island. The ride called "Queen Charlotte Drive" offers one twist after another and awesome views over tranquil bays and is a good way to say 'good-bye' to the South Island. Sunbathing on the deck of the ferry, the others laugh at me when I point at dolphins playing in the water. Soon everybody on the vessel is on their feet watching them whirling around the boat. Wellington is only a short stop-over where Francesca welcomes us in her unique art-deco women's guesthouse. From there we ride north along terrific coastline and then inland towards the high plateau of the vulcanoes. Tonight we are invited to stay on a marae, the traditional meeting house of the Maori community. Maori are New Zealand's first settlers, arriving from Polynesia over one thousand years ago. They represent the rich culture of the South Pacific in New Zealand. We are greeted by warm dark-brown eyes and as we walk onto the marae, another woman performs the karanga, the welcoming song. It's so beautiful it makes the hairs on my neck stand up. Inside a koumatua, or elder, tells us the story of their whakapapa, their families, their area and their ancestors with pride and dignity � and in Maori, of course. Then they sing their song of heaven and earth and everything in between. Now comes our moment. They don�t know we have practiced this, our hosts listen benevolently. We have proven that we are not completely ignorant and as soon as the official part is over we are made very welcome. The night remains special just as it began with a hangi, a meal cooked in an earth oven and traditional songs. The next morning it is hard to say good-bye to our newly found friends. They made us welcome and we feel as if we have spiritually arrived at this place they call Aotearoa � The Land of the Long White Cloud. Off to the thermally active area of Rotorua for more adventures, boiling mud and geysers, and then on to Mt. Maunganui for some relaxation, lovely sea views and inviting beach promenade. We enjoy a warm spell as we ride north of Auckland to the beautiful Bay of Islands, where the European settlement of New Zealand began with the landing of James Cook in 1769. All too soon we reach Auckland and with it the end of our tour. For 22 days we have shared the highlights of New Zealand and all the emotions that are part of this experience. The riders have become Towanda Women family and as they leave they take a piece of us TOWANDA Women and Aotearoa with them.